After the BRICS, came the PIGS. Now a new acronym is being born, that of the BELLS. These particular “ding-dongs”, however, are not a set of hollow cast-metal instruments suspended from the vertex and rung by the strokes of a clapper, they are countries, countries which may, like those unfortunate WWI British soldiers whose love of their country and sense of duty lured them into one of the most senseless conflicts of modern European history, be headed towards their own pretty unique form of modern purgatory. 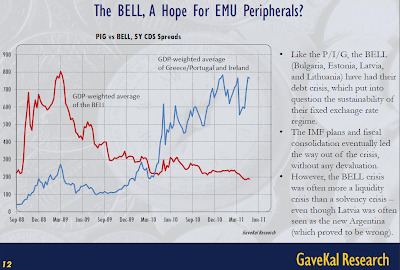 The BELLS are a group of four countries (Bulgaria, Estonia, Latvia and Lithuania) who in their wisdom decided to adopt and then stick “come hell or high water” to a currency peg with to Euro. Thus was opened one of the more interesting and lively chapters in modern macroeconomic debate. Now talk of some sort of ultimate inferno here may strike a pretty discordant note with many readers, since most of the economic chatter of recent days has centred on how the BELLS constitute a positive example, not to mention a most attractive alternative to all those dreadful sounding PIGS. 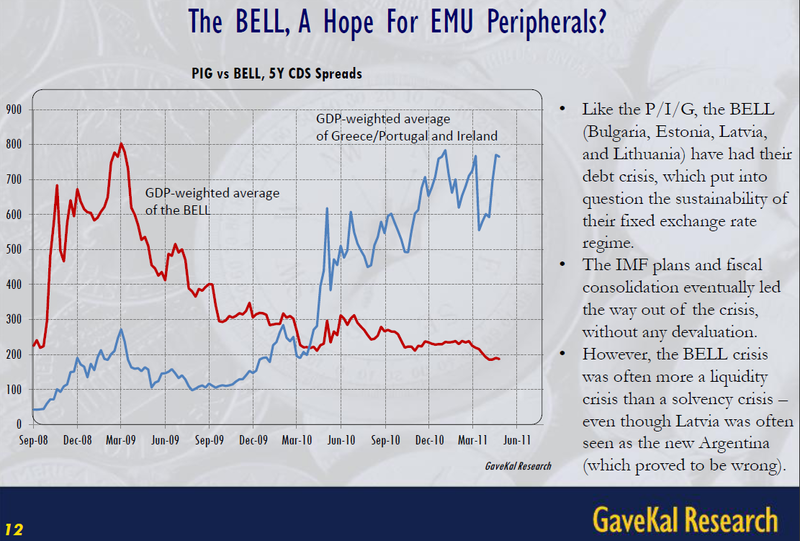 According to GaveKal’s FranÃ§ois-Xavier Chauchat, for example, the BELLS should be seen as a ray of “Hope For EMU Peripherals”, since just like the PIGS the BELLS have also had their own debt crisis, one which was so severe at the time that it put into question the very sustainability of their fixed exchange rate regimes. However, in these most fortunate of cases, the bad times are now well and truly behind us since a happy combination of IMF programmes and fiscal consolidation (coupled in Estonia’s case with subsequent admission into the Euro group) eventually led them out of crisis, and without the need for any sort of sordid devaluation to boot. And then, as they say in Spanish “fueron felices y comieron perdices” (or to put it the English way, “they all lived happily ever after”). Or did they? Well, on Chauchat’s view, the BELL crisis was always more of a liquidity than a solvency one (see chart below) â€“ and this despite the fact, which he notes, that Latvia was very often argued to be a modern equivalent of the Argentina of the late 1990s (an assertion which, he says, has ultimately proved to be wrong, although in fact on this particular solvency vs liquidity argument, the true test will be the ability of Latvia to pay back the 7.5 billion euro EU/IMF bailout loan, in full and on time, and especially the very onerous 2014/15 installments). From a macroeconomic perspective, however, the big issue was always one of just how the hell these countries were going to dig themselves out of the hole they had dug themselves into, and do so at the same time as staying on the peg. A Profession That Is Losing Its Grip On Reality? The view that the BELLS have somehow proved the monstrous regiment of professional macroeconomists totally wrong is now quite widespread (for a balanced and more nuanced version of the argument see this post by my fellow RGE Economonitor blogger Ed Dolan) , and indeed such sentiment may well form part of a much more general dispute between micro- and macroeconomists about how to find solutions to the present crisis. Only last week the Latvian Prime Minister Valdis Dombrovskis presented a book in Riga which he has co-authored with Anders Ã…slund of the Peterson Institute which has the rather assertive title: How Latvia Came through the Financial Crisis. The associated press release proudly states that a key lesson to be learnt from the resolution of Latviaâ€™s financial crisis is that “devaluation is neither the panacea nor the necessity that many economists make it out to be”. “Finally, the international macroeconomic discussion was not useful but even harmful. Whenever a crisis erupts anywhere in the world, a choir of famous international economists proclaim that it is â€œexactlyâ€ like some other recent crisisâ€”the worse the crisis, the more popular the parallel. Soon, prominent economists led by New York Times columnist Paul Krugman claimed that â€œLatvia is the new Argentina.â€ A fundamental problem is their reliance on a brief list of â€œstylized facts,â€ never bothering to find out the facts”. As a macroeconomist who has been deeply involved in the Latvian debate I have to say that if such statements weren’t so foolish (and ill-befitting of the Prime Minister of any country) I would want to protest that they were extraordinarily condescending and even verging on being insulting. As someone who has spent hours and hours during this crisis perusing excel sheets and making charts trying to fathom what is going on in the BELLS (and in particular in Latvia) I have to say I certainly don’t recognise myself in this paragraph, and if anyone could be bothered to take a look at that infamous Krugman piece they would find he was basing his argument not on some obscure set of stylised facts, but on my detailed analysis of the problem (right or wrong, but here it is – why the imf’s decision to agree a Latvian bailout programme without devaluation is a mistake). The funny thing is I, far from having learnt from the error of my ways, consider still consider the original IMF decision to have been a mistake, although I would point out that I personally never suggested Latvia was like Argentina (another thing is to say that much of what is going on along Europe’s periphery of late carries with it a distinct sense of Argentina deja vu), since I actually think that Argentina is an example of what not to do and that if you are looking for historical precedent for what should be going on in Latvia (read the BELLS) Turkey would be a much better role model. I also think that one of the conclusions we will eventually be able to draw from this whole sorry affair is that those who specialism is not macroeconomics would do better dedicating more of their precious time to trying to understand what we are saying rather than engaging in ill-informed ideological polemic. And I say this since I believe that the Latvians themselves deserve better. They may well not be able to avoid serving as guinea pigs, enabling macro- and microeconomists to see just who is right, but they surely don’t merit being converted into yet another ideological football. Didn’t we have enough of that during the Soviet years! On the other hand, and before getting into the actual analysis, I want to stress that I personally am not advocating devaluation of the Lat at this point in time. Even though I still consider it a mistake not to have devalued, and an even bigger mistake on the part of the EU leadership not to have accepted the IMF proposal for immediate devaluation and Euro entry, I accept that the decision not to devalue represented the democratic will of the Latvian people (following the advice of the IMF given the EU response), and it was for precisely this reason that I declined to go to Latvian in August 2009 and speak at a meeting organised by the then governing People’s Party, since I think I was only being asked to go there to cause trouble. The difficult thing here is not to cause trouble (which is easy) but to find realistic solutions, which is why we need free and open debate. 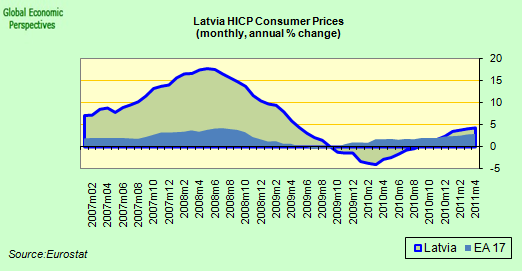 Did Latvia’s Internal Devaluation Cut Hard Enough And Deep Enough? 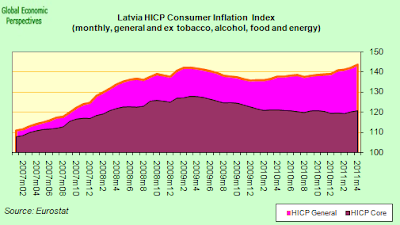 The point, I think, is this: if Latvia is not going to recover the competitiveness all agree it lost through a normal devaluation process (for whatever reason) then it needs to do so via the procedure which has become known as “internal devaluation” (a procedure which in an earlier era was known by the name of “wage and price deflation”), and indeed this is what the Latvians have attempted to do. So the question now is has this worked? Or put another way, has the internal devaluation gone far enough and deep enough? 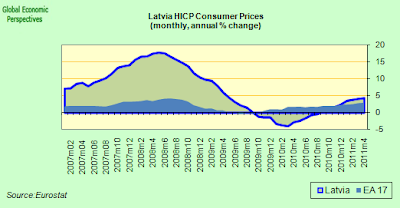 The conventional wisdom has it that it has, but I, for one, am not convinced, and looking at the latest round of Latvian data serious questions arise as to whether the recovery is strong enough or sustainable in the longer term. Growth started to return to these economies in the second half of 2010, but with capital inflows now well below pre-crisis levels they have now entered a lengthy and difficult adjustment process. With domestic demand well below earlier highs and still struggling, exports have now become the prime mover of economic growth. Since the recovery in external demand has produced a rapid return to earlier export peaks the impression of a return to earlier economic dynamism has been created. I think this interpretation of the recent strong export growth is misleading, since it is one thing to recover lost ground, and quite another to attract the FDI needed to seriously expand capacity and keep increasing exports beyond their pre crisis peak. Strong year-on-year increases in exports have moved headline GDP numbers forward, but as 2011 continues annual export growth rates will drop substantially, and may even get stuck at a snailâ€™s pace, meaning that the respective economies will be struggling to find growth, create jobs, and maintain the servicing of their external debt. In my opinion, and despite some early encouraging signs, it is far from self-evident that the so called â€œBELLSâ€ (Bulgaria, Estonia, Latvia and Lithuania) are going to be able to export their way out of trouble in the way they need to (given the collapse of internal demand) with the current relative price structure. It is my considered opinion that the â€œinternal devaluationâ€ process may have been underambitious and allowed to come to a halt far too soon. And indeed, if we get to the point, this is why so much of the conventional macroeconomic wisdom and advice leans towards open devaluation, simply because it is hard to maintain the political consensus for long enough to carry out a deep and painful deflation adjustment, and indeed this is the lesson drawn from the 1930s that I was brought up on. In addition two major unresolved issues may leave a legacy, one which could weigh down any recovery and lead to more serious problems when the next recession eventually arrives. Many observers seem to forget that it is one thing navigating a leaky ship when you have the wind behind you, and quite another one going face-forward into a tempest. b) The demographic challenges the country faces, and in particular the impact of a rapidly ageing and declining population. But before getting into this, let’s take a serious look at the current state of play in the Latvian game. GDP growth is currently slowing. Latvian GDP expanded by a quarterly 1.5% in Q3 2010, by 0.9% in Q4 and by 0.2% in Q1 2011. 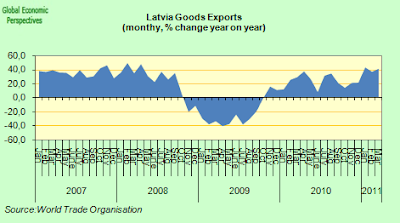 Thus Latvian GDP has been steadily slowing, and this despite the fact that the export environment in the first three months of this year was exceptionally positive, and Latvian exports were booming. 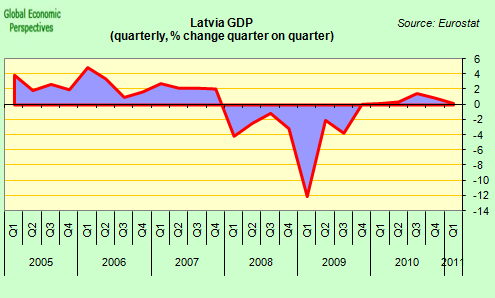 Latvian GDP fell by around 25% during the crisis, and has subsequently rebounded by 5% (over 5 quarters). We are far from a “V” shaped recovery, and pardon me if I mention it, but it is precisely the sort of thing most macroeconomists were imagining would happen. Essentially the problem is that consumer demand has failed to recover, and if my analysis (about ageing and the debt overhang) is right then it will continue to fail to recover (all of this, incidentally, is what I argued would happen after the crisis broke out). Industrial output languishes (partly because the non-tradeable sector is contracting as fast as the tradeable one is expanding). Obviously a large part of the investment slump is due to the decline in consumption activity, but there is little sign of a serious pick-up in ex-construction investment, and anyway, outside of construction there was comparatively little investment going on in the period before the bust, and very little FDI. iii) a high level of unemployment, low rate of job creation, and a substantial wage differential with Western Europe which encourages young people to emigrate and drift west. The first two problems put a serious brake on economic growth, and it is this that exacerbates the third problem, which then in its turn feeds back and aggravates the first two. 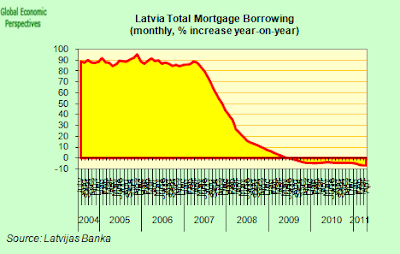 Cheap interest rates, supported by the peg and the prospect of Euro membership meant that Latvian households and corporates were able to get themselves heavily into debt. And debt in Euros (which is why the devaluation difficulty exists) – over 85% of Latvian mortgages are Euro denominated. Now the Latvian economy is experiencing a sharp credit crunch, private sector credit which was increasing in 2007 at a rate of around 65% is now falling at a rate of 9% per annum. Has The “Internal Devaluation” Been Called To A Halt Too Soon? “The competitiveness adjustment has been substantial; labour costs fell 25% from the peak. The gap that opened up between productivity growth and labour costs in the boom years has already been closed. Exports responded sharply. Resources have not been switched among sectors, but production has been redirected from domestic use to exports”. “Strong policy actions under the SBA have helped restore confidence, contributed to economic recovery, and enabled significant progress toward Latviaâ€™s goal of euro adoption. The government has continued to achieve substantial fiscal savings while also protecting the poorest through social safety net spending and a temporary public works jobs program, and is strengthening its active labor market policy efforts. Looking ahead, the government has committed to meet the Maastricht criteria for euro adoption and strengthen the financial sector, which should further enhance confidence and support a rebound in growth”. In addition to maintaining the existing fixed (narrow-band) exchange rate, staff considered a number of alternative exchange rate options. These included, inter alia: (i) widening the current exchange rate bands to the full 15 percent range permitted under ERM2; and (ii) accelerated euro adoption at a depreciated exchange rate. The main advantage of widening the bands is that it should eventually deliver a faster economic recovery. Although growth would be depressed in the short run by balance sheet effects, the economy might then bounce back more sharply, and a Vshaped recovery would likely start in 2010. This reflects a faster improvement in competitiveness since high pass-through (reflecting Latviaâ€™s openness to trade and liberalized movement of labor within the European Union) would be dampened by the negative output gap. Enhanced competitiveness would also reduce the current account deficit more quickly. This would come mainly from import compression, with a relatively slow response of Latviaâ€™s underdeveloped export sector, especially as the external environment is not as supportive as in previous devaluation-induced recoveries as Argentina, Russia or East Asia. So at the time a 15% exchange rate adjustment was being contemplated. Did we get that? Well I personally don’t think so. If we look at the CPI, the drop (from peak to trough) is only something like 3%. In fact the producer price index fell a little further, maybe by about 12%. But as can be seen, in both the CPI and the PPI case, since these indexes bottomed prices are now rising again. And indeed they are rising faster than is the case in those countries with which the Latvian currency is pegged (the Eurozone 17). 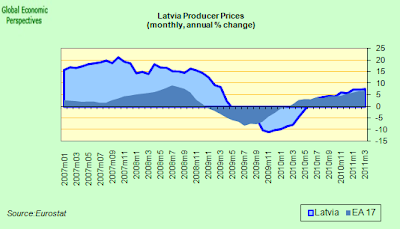 So in fact, and especially if we take as a point of reference the start of 2007, we can see that the actual price correction has been comparatively small, and indeed the position is once more deteriorating, even though output in the Latvian economy is over 20% below its pre-crisis peak. Is that really such a flexible situation? A similar pattern emerges if we look at wage costs and productivity. As we can see, despite having a relatively high standard of living Germany has managed to maintain unit labour costs relatively stationary over the last decade, due to rising productivity. Latvia evidently has not. 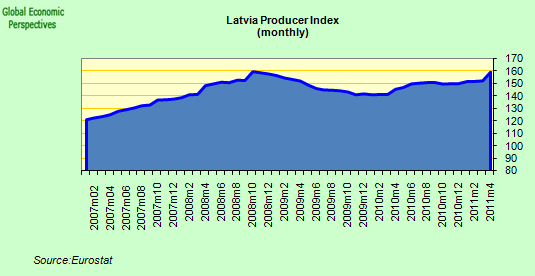 This has nothing to do with being rich or poor, as can be seen from the years 2000 to 2004 Latvian living standards were rising, but they were rising in line with productivity, which is of course perfectly sustainable, and basically the pattern you want to see. 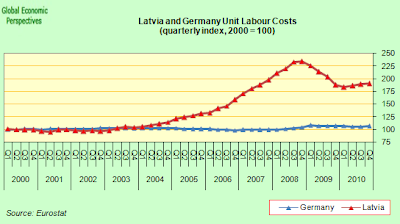 Then from 2005 onwards the link was broken, and Latvian wages exploded in a way which was totally unsustainable. During 2008 and 2009 unit labour costs started to improve (in part because a lot of very unproductive workers in construction lost their jobs, the pattern in Spain is similar) but from the start of 2010 onwards the process has been in reverse gear again, and once more it is interesting to note that German labour costs (even though the economy is booming) are not following suit. A lot of ink has been spilt writing about the large drop in wages in the public sector (possibly over 20%) but unfortunately public sector workers normally don’t export, and if we come to look at private sector wages, and especially hourly wage rates, then we again find that the correction has not exactly been massive, and of course, inter-annual wage rates are once more starting to rise. 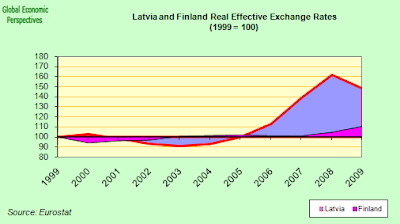 The rough and ready measure most macroeconomists like to use when it comes to competitiveness changes if the Real Effective Exchange Rate, and as we can see from the chart below, the loss of competitiveness (when compared in this case with Finland) since 2005 has been substantial. But then when we use REERs most people who really aren’t that convinced that exchange rates matter tend to be not very impressed. So let’s try and put the argument another way. 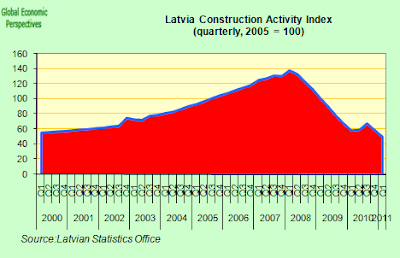 The real proof of the pudding is in the eating, and the real test of Latvian competitiveness is whether, now that it is totally export dependent, the Latvian economy will be able to produce sufficient economic growth and employment such that the weight of the debt can be steadily burnt down. And let us remember here the currency pegger’s (or euro member’s) catch 22: growth in nominal GDP is what matters when it comes to reducing debt, and nominal GDP is composed of real growth and inflation, so in a way inflation could be beneficial, but any inflation you have which is over the level of your countries of reference (the Euro Area 17) will lose you competitiveness in a way which reduces real growth, so you are up against a limit on both sides (deflation, which makes you more competitive, only compounds the debt problem) and possible the most appropriate characterisation of the situation would be “trapped”. Which means growth in GDP = Growth in the sum of the above factors. Now we know that domestic consumption is in decline, and that investment in plant and equipment will only return in statistically interesting volumes to meet the needs of export growth. We also know that government spending is being reduced (that is what the IMF programme is centered on), so all we are left with for a real growth driver is exports. 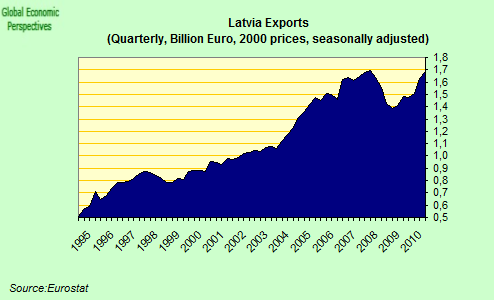 But when we come to look at the SIZE of the Latvian export sector, we will see it is way to small for the job. 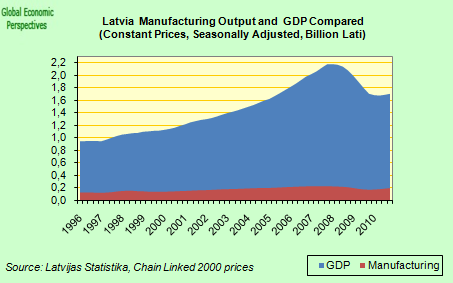 The chart below comes from national accounts published by the Latvian statistics office, it shows GDP and value added in manufacturing industry. I think it is obvious that the proportion here is horribly small (only slightly over 10%), since even though Baltic economies generally are fairly open, many of the exports are in fact imports that have been reprocessed so actual proportion of their value produced in the country is not large. Germany by comparison (which is a modern economy, with reasonable living standards) has over 40% of GDP originating in value added in manufacturing. 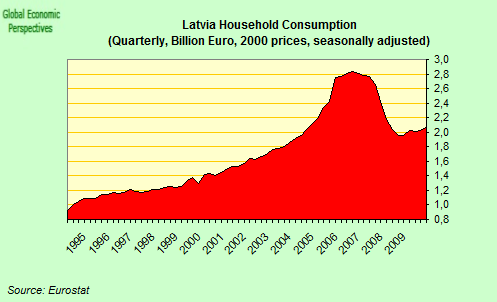 Yet this tiny part of the Latvian economy is now about to do the heavy lifting? It just doesn’t make sense. Nor does it make sense that the IMF focus so much attention on reducing the fiscal deficit and virtually none on this issue, yet it is on resolving this issue that Latvia’s economic future belongs. 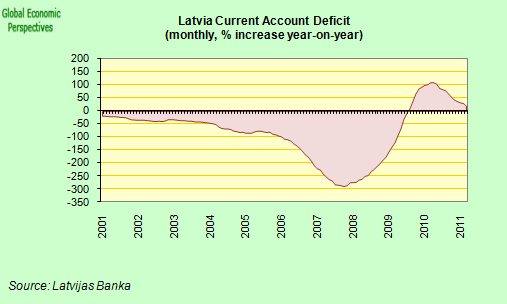 There is another piece of evidence that Latvia’s internal devaluation has eased up far to soon, and this comes from the current account. 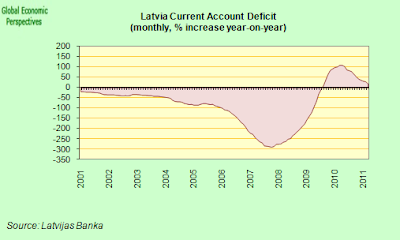 A great deal of praise was lauded on Latvia for the rapidity with which the current account went into surplus. In part this was the “ouch” effect, as financing dried up, people lost their jobs, and imports fell sharply. Exports, as we have seen, also improved, and this certainly helped. But there was another factor which we should also take into account, and that was what happened to the income account. This is composed of interest payments and returned profits and dividends. 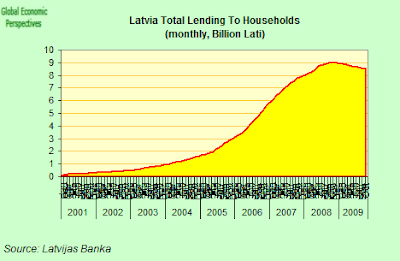 Now Latvia has a net external debt of not far short of 100% of GDP, and this involves a lot of interest payment. As is well known, most of this debt is denominated in Euros, and attached to Euribor interest rates, so of course, as the ECB brought rates down, interest payments came down in like fashion. At the same time, as the economy was contracting by 25% firms were producing a lot less in the way of profits, and there were far fewer dividends. Now things are improving again, and as we can see in the chart below, the current account is once more moving back towards deficit. This is not a good sign. So there we are, these are my causes of concern, and I think it is now over to those who already feel that the devaluation debate has been shown to be irrelevant to suggest what they think should be done next to put Latvia back on the “internal devaluation” track again. When I suggested at the start of this post that Latvia might be stuck in a peculiar kind of hell, possibly limbo would be a better term. 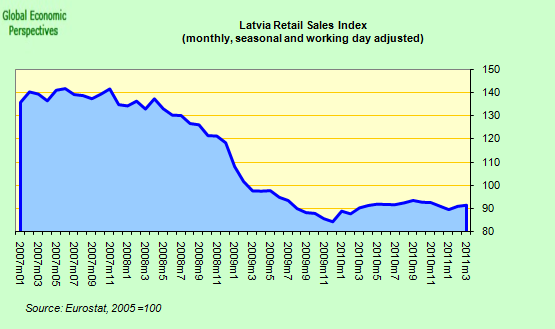 Latvia’s current situation is hardly comfortable. Unemployment is still very high, and new employment is only arriving in a trickle. Meantime the debts are still there, and the problems people are having paying them haven’t gone away. In this sense a “restructuring bomb” is still ticking away under Latvia, and rather than continually crying victory maybe it would be better if more people (Prime Ministers included) dedicated a little more of their energy to trying to defuse it. This post first appeared on my Roubini Global Econmonitor Blog “Don’t Shoot The Messenger“. Sorry, but the expression “the BELLS have also had their own debt crisis” is just wrong. None of the BELLS had any kind of acute debt crisis at the end of 2008. 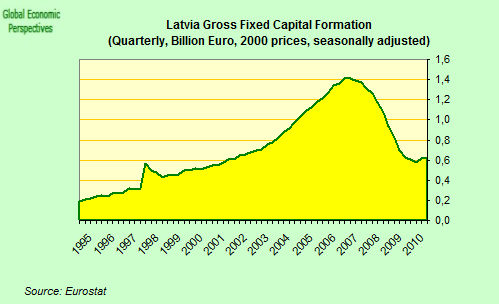 The unhappy Latvia was hardly hit by bank crisis caused by fraudulent activities at its second largest PAREX bank. Lithuania and Estonia even did not have that kind of problem. In Latvia the crisis in private banking sector rapidly was shifted as a burden to the sovereign, under direct pressure by EC and ECB. But thatâ€™s nothing new, Ireland has the same failure model. The temporary advantage of Ireland is, however, being part of ECB – in ultima ratio case the Irish national bank can print as many euros as necessary and fill the gaps. Latvia reasonably was threaded with a bankruptcy in the first half of 2009, which explains the first graph. 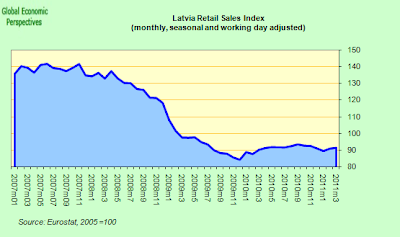 However, banking crisis in Latvia did not grow to systemic dimension. The real problems in Latvia and other BELLS have not been solved, and there is no solution in sight. The uttermost problem is enormous loss of competitiveness due to EU-induced enormous monopolisation of everything and loss of at least 10% of population of highly qualified people. 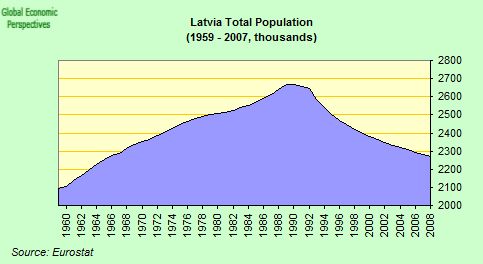 The last census builds suspicions that Latvia has lost even 25% of population â€“ the census has stopped at 1,9 Mio inhabitants. Corruption in the European Commission plays an important role in creating monopolisation and promoting price growth. The devaluation of lat at the moment is nonsense. Interest rates in lats are lower than in EUR. Lat should be appreciated; this will ease the debt burden. Meanwhile, why the IMF is not publishing full reviews anymore? Instead of explaining the issue by thinking that there has been too little internal devaluation, I choose to assert simply that the theoretical concept of internal devaluation cannot and does not work. The bells debt level was no where near the piggs debt levels. for example ireland and spain bank debt went through the roof in their own construction booms.. It would be interesting if you would include the other BELLS in your analysis and explain why Estonia and Lithuania are experiencing a much stronger recovery than Latvia (although they are also not out of trouble yet). I will be very carefull with stronger recovery in Estonia and Lithuania. Part of that is just self-advertisement based on internal services. In the analysis has a big flaw: Latvia is by far the biggest services exporter in the Region, much bigger than Estonia and Lithuania together. Tourism is ok, but the Latvian Rail is a bigger carrier than Hungarian MAV (TKM) and close to Austrian OBB. This means that 1911 or even 1811 unit labor costs in for instance the UK might have been lower than 2011 ones, for instancce because of a higher share of the ‘self employed’ in the economy (farmers, taylors, whatever). 2010 Latvian GDP was as high as in 1990…. (but this time, unemployment is 16-20%). Liquidity and solvency are one and same thing. Such a pity that latin is not taught anymore in schools! Solvent/soluble is something that can be diluted and became liquid. Yep, I agree, each case is different, and I must do individual studies on each of them to see exactly what is happening and to try and understand why. Latvia is just the clearest case, has been the centre of most controversy, and anyway it is the one I have followed longest and most closely. All in the fullness of time. According to the latest data available on eurostat, Estonia and Lithuania grew more than twice as fast as Latvia year on year, Latvian quarter on quarter growth was even almost flat in the first quarter of 2011, compared with robust growth grates rates for Estonia and Lithuania. So, untill now their recovery has certainly been stronger. Is it grow of industry or services? 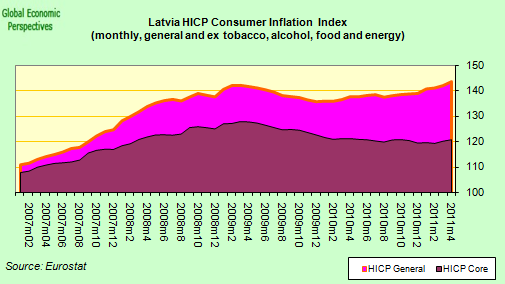 Estonia has manipulated its data not less than Greece. “According to Statistics Estonia, in April 2011 the production of industrial enterprises grew 32% compared to April of the previous year. The production showed a 30% growth for the eighth month in succession compared to the same month of the previous year. The growth of production has been mainly influenced by the increase in external demand as previously, but the domestic demand also increased compared to April of the previous year. Maybe you can explain in what way their statistics are manipulated? And, as far as I know, Greece didn’t manipulate its statistics concerning GDP growth, but those concerning budget deficits and government borrowing. I read an interview with the Estonian President in the SÃ¼ddeutsche Zeitung at the beginning of May, available on the embassy web site, which reveals a truly odd state of mind. He says in as many words that “if we keep going with our radical cuts plan, we will no longer be the poor relations and we will be listened to”. And everyone’s willing to make sacrifices because “we” were occupied by the Russians. I say “we” in scarequotes because he was born and grew up in the USA. He seems to regard his own country as a colony. In March Latvian industrial production increased with 9.8% year on year, in Estonia 33%. I hope you can still indicate in what way Estonian statistics are manipulated. 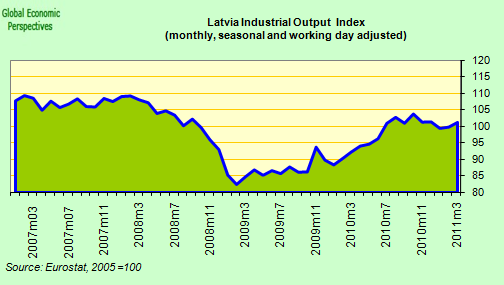 Industrial growth in Latvia April y-o-y has been 13,7 %. To Alex: this view is enormous typcial, also the government of Latvia speaks always in neo-colonial terms. The explosion of neo-colonial rethorics happened when people did not understand why the sovereign must rescue bancrupt private banks. Did Estonia prosper in the present crisis?? I can imagine that a neoliberal like Ansip believes this. But Ilves is a social democrat. Does he really believe that a country prospers when it loses 20 of GDP in two years (5% of this has been recovered untill now), and, more important for a social democrat, when unemployment rises from 4% to 19% (now still 14%)? More than half of Estonian unemployed have been without a job for more than a year, this means they have to make ends meet with only 75euros a month. Let Ilves switch places with them if he thinks this is ‘to prosper’. looking at the Eurostat seasonally adjusted data we see that Estonia is still growing during the last six months, but Latvia and Lithuania aren’t. Poland is. I do have to admit that the seasonal correction will be rather crude, considering the magnitude of the BELLS crisis and accompanying changes in economic structure. But even then. While agreeing that industrial dynamics in Latvia is weaker than in Estonia and Lithuania, there is no need to build theories to explain it. The explanation is plain: Latvia had to sacrifice in very short time 1/3 of annual GDP to rescue the insolvent PAREX bank, that was imposed by ECB, EC and USA. Nothing of the rescue costs has been recovered until yeat. Estonia and Lithuania had zero bank bailout costs. Who needs more sophisticated explanations?? The growth of Lithuanian industrial production was actually lower in April than Latvia’s: +6.8% (year on year). 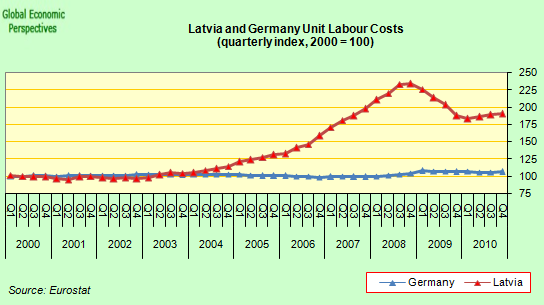 Because Lithuania did not suffer such an extreme fall of GDP in 2009, and the unemployment in Lithuania is the lowest in Baltics. Unemployment in Estonia is the lowest in the Baltics. The estonian economy also didn’t have such an extreme decline as Latvia, but industrial production is booming. But that’s not the point. 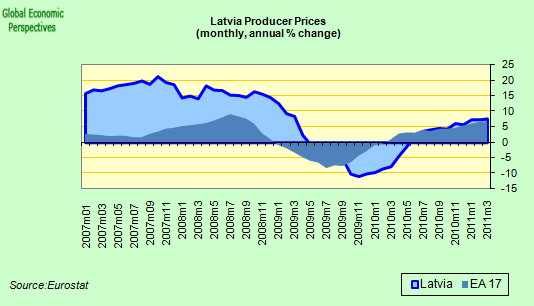 Lithuanian GDP is growing at a very strong rate, but what is the main force behind this growth?